Wednesday we took an awesome sailing trip on a 40 foot catamaran. We slept in and made our way down to the beach to browse the shops on the main drag before the trip. Then we got picked up bye a small motor boat on the beach and shuttled out to the catamaran anchored in the bay. The crew on the boat was great, we had all you can drink libations and a snacks. The crew turned us on to the “Costa Rica Special” a mix of Cacique Guara (costa rican rum) and fresca…great! We sailed around the point of the bay and dropped anchor to do some snorkeling. The crew went out with us and were great at finding cool fish, even helping us touch and hold the safe ones. After about an hour of snorkeling it was back to the boat for more drinks and snacks and the sunset. It was a little cloudy so the sunset wasn’t as spectacular as it was on Monday, but nothing could dull our spirits! After the trip it was dinner at Pasatiempo and more relaxing away the evening in the hammock! 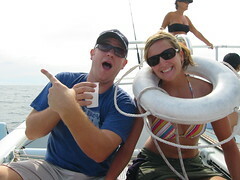 This entry was posted in Costa Rica 2004 and tagged costa rica, Tamarindo by The Gordons. Bookmark the permalink.